CHOPIN FREDERIC, 21 SELECTED PIECES. Richard Yates. 165 Pagine, 21 pezzi. TABLATURE. 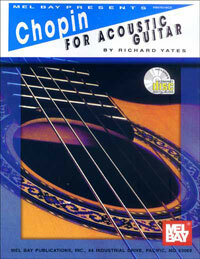 A collection of favourite Chopin pieces arranged for solo guitar by Richard Yates in standard notation and tablature. Includes Mazurka Op.24 No.3, Valse Op.69 No.1 and Etude Op.10 No.3. CHOPIN. FOR GUITAR. CD TAB. Frederic Chopin was one of the most original and influential composers in history. Although he only lived 39 years, he wrote music that has thoroughly embedded itself in our culture. His melodies are often instantly familiar to us and show a profound lyric sense. Many qualities of Chopin's music are ideal for guitar transcription. He wrote pieces that are short with a manageable range. The textures are mostly single melody lines with harmonic accompaniment without the complex counterpoint that can be so difficult on the guitar. His music is often soft, intimate, subtle, and full of naunces of articulation, dynamics, and phrasing. These qualities transfer quite naturally to the guitar. While remaining as faithful as possible to the composer's musical intentions, these pieces experienced some modification that is noted in the provided performance notes. Intermediate in difficulty, this book assumes the player has basic knowledge of the guitar and familiarity with either standard music notation or guitar tablature. Selections include: Prelude Op. 28, No. 7; Prelude Op. 28, No. 20; Prelude Op. 28, No. 4; Cantabile; Mazurka Op. 6, No. 2; Prelude Op. 28, No , 15; Nocturne Op. 9, No. 2; Nocturne Op. 15, No. 3; Nocturne Op. 37, No 1; and Nocturne Op. 55, No. 1. All of these beautiful pieces are included on the companion CD.